Shake It Off - Why Do Dogs Shake Their Bodies? 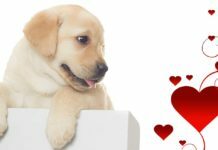 Home Labrador Facts & Fun Shake It Off – Why Do Dogs Shake Their Bodies? In this article we ask: why do dogs shake their bodies? We all know that dogs shake when they have been swimming. Watch everyone ‘run for cover’ when your Labrador climbs out of the stream! But dogs shake at other times too. So what exactly is going on? Why do they do that? All dogs shake after swimming or being bathed. But many dogs shake after being groomed too. They shake after greeting people, during intermissions in play, and after hugging or cuddling. Lots of dogs shake out after jumping down from the vet’s table, as if to shake off the memory of what just happened. Sometimes a dog might shake because they’re under the weather. All of these shakes serve an important purpose, or can tell us something about how your dog is feeling, as we shall see! Rapid shaking helps to generate force. The movement starts from the inside and amplifies as it moves outwards, so that in no time your Lab’s skin and fur is rippling and whipping about. Watching a slow motion film reveals all. Have a look at this very cool video which compares a hedgehog, a rat, and a Labrador. The Lab is about three minutes in to the film. He’s clearly shaking because he’s wet, so let’s start here first too. Being wet is a big problem for wild dogs in cool climates. Wet fur is only half as good as dry fur for keeping dogs warm. Water on the coat evaporates as it is heated up by the dog’s warm skin. This evaporation causes rapid cooling on the surface of the skin. On top of this, wet fur clumps together, which leaves gaps in between the clumps. These those gaps don’t trap warm air close to the skin as effectively as fluffy dry fur. So your dog gets colder still. To warm up, your dog needs to remove the water from his fur as fast as possible. If they don’t, the loss of heat from their skin can become a massive drain on their energy. In fact, a wet 60-pound Lab, with one pound of water in its fur, could lose 20% of their daily calorie intake while they wait to dry. Luckily though, they have a better solution. Why do dogs shake their bodies to get dry? Your Labrador’s ancestors did not have a friendly human on hand with a nice warm bath towel. But they did learn how to shake, and fortunately shaking is a very effective way of getting dry. And it turns out Labrador shaking isn’t just fascinating for dog owners. In 2012 mechanical engineers Andrew Dickerson, Zachary Mills and David Hu at the University of Atlanta studied the shaking mechanisms of five different dog breeds, and 16 other mammal species. They found that Labradors shake at a frequency around 5 hertz, which is five cycles a second in plain English. 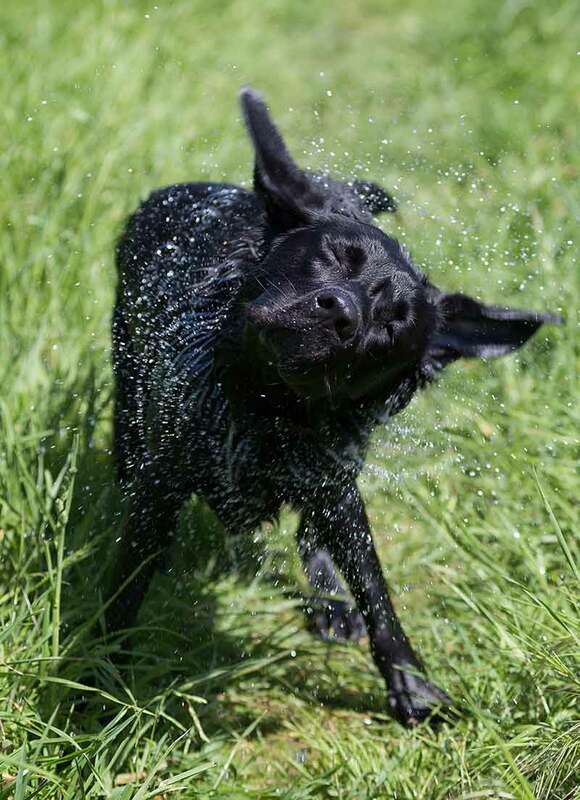 And by doing this, a Labrador can remove up to 70% of the water in their coat in a single shake off! Furthermore, this frequency is precisely adapted to Labradors’ size. Dickerson and his team found that smaller mammals shake out water at a higher frequency, and larger mammals do it at a lower frequency. Why do dogs shake when they are not wet? Next let’s turn to the Labrador shaking off even though they’re already dry. Why do dogs shake their bodies if they’re not wet? There are a few reasons in fact, and we’ll go through them one by one. Most dogs will shake after being released from a hug. And also after a stressful experience such as an interaction with another dog, or even during a break in rough play. Shaking increases blood flow to the skin and can therefore be a useful automatic response to minor or superficial injuries. Some experts believe that dogs process emotional discomfort in a similar way. And that is why they automatically shake when they are ‘under pressure’. But what about shaking after that hug? Most experts agree, that many dogs don’t actually enjoy being hugged very much. It is a human way of indicating affection that dogs learn to accept and tolerate. But it can make them feel a little uncomfortable. Hence the shake afterwards, which is simply a way of defusing that feeling of social pressure. Hugs aren’t the only things that can feel stressful for your Lab. Visiting the vet, meeting a new person or dog they don’t know and going into an unfamiliar environment can all be stressful. If your Lab came from a rescue center or animal shelter, he could have anxieties and phobias which it takes time and patience to identify. Shaking off is a classic indicator that your dog is stressed, and looking for patterns in when they shake off can help you identify the triggers. To recognize a stressed out shake, look for other signs of stress at the same time, such as whining, barking, yawning, drooling, licking, dilated pupils, pinned back ears and a rigid posture. 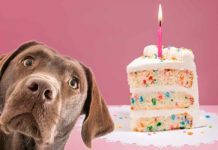 If you think your Lab might be shaking off because something is upsetting them, visit our article about helping nervous dogs and managing canine phobias. Shaking is also a good way for the dog to help keep his coat in good condition. Dogs will clean specific parts of themselves by licking. But they don’t use licking as a general cleaning device in the way that cats do. However, shaking is a very good way of flicking debris and dust particles out of the coat. 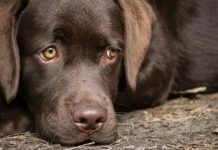 If your Lab regularly shakes out at the end of a walk, or shakes off more often on a dry dusty day, this could be your reason. 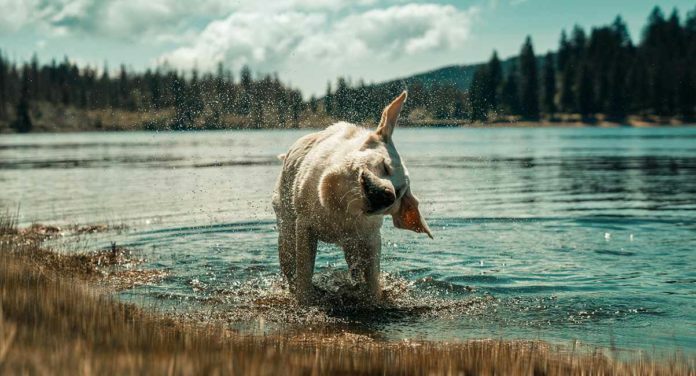 Sometimes your Labrador shaking out could be a sign that they’re not feeling physically 100%. Common reasons why dogs shake due to illness are ear infections and skin conditions. Why do dogs shake their bodies when they have an ear infection? Head shaking or ear flapping is a common symptom of ear infections in Labradors. Ear infections feel itchy and uncomfortable (if not outright painful) and often disrupt our sense of balance as well. Shaking of is an instinctive way to suppress these sensations, if only for a second. 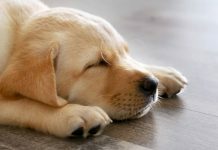 If your Lab suddenly starts shaking their head more than usual, or they have any other symptoms of an ear infection, take them to the vet right away. Another reason you Lab might shake is to give a moment’s relief from the pruritis (itchiness) caused by a skin condition. This might mean dermatitis, or a parasitic infection such as fleas, mites or ticks. It’s likely to be accompanied by lots of scratching too, so if your Lab starts shaking and scratching more frequently, ask your vet to help you work out why. Why do dogs shake their bodies? Labradors shake to dry off, release tension, keep clean, or sometimes as the symptom of skin irritation or an ear infection. The mechanics of shaking dry are finely tuned and an amazing survival adaptation. Without them, a wet dog in a cold climate would quickly lose energy, or worse, get hypothermia. When dry dogs shake off, it’s usually a reflexive reaction to something which is happening to them. Sometimes it’s a valuable insight into how your dog is feeling. If notice your Labrador shaking more often than usual, or always in response to the same thing, then you’re already half way to helping them. 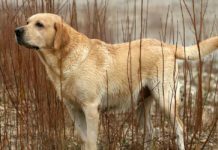 So don’t overlook your Labrador shaking off – appreciate those shakes for what they do and what they can communicate! Do you often see your Labrador shaking off? Does your dog shake after a hug, or when he has been playing with another dog? 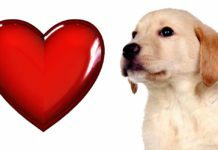 Tell us if you’ve ever deciphered your Labradors shakes and what they meant using the comments box. Next articleBest Large Dog Breeds – Which Are the Top Family Pets? Our Miss Mattie shakes each time there is a change in events. If ask, ‘do you want to go for a walk?’, she jumps up, ready to go and does the shake down. With her, it seems to be part of her getting ready for whatever is going on. It’s part of her excitement and anticipation…..not stress, at least in her case. Hi Harriet. My lab will also shake when we’re getting ready for a walk, if I take too long then it can also be accompanied by a yawn. A mixed dog is called a mongrel period ! Leave the Labradors alone ! I have enough trouble finding a Labrador with hunting instincts due to all the fat “show ” dogs . Years ago they drowned them to keep the breed pure .